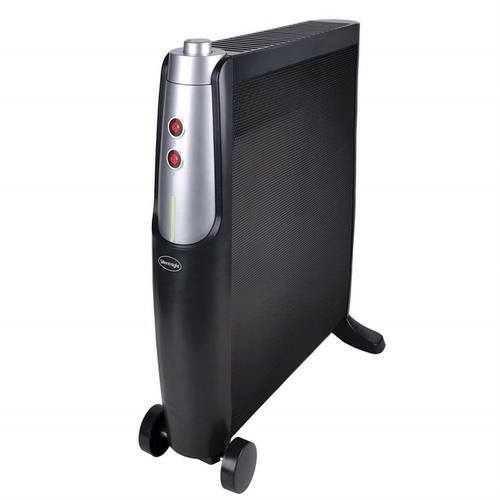 This 2.5Kw free standing Mica Convection and Infra Red heater has two wheels for extra portability and heats up in 1-2 minutes so can get the room warm as soon as you need it to be. Mica technology uses thin sheets of Mica around the heating element which converts the electricity into both convection and radiant heat. A thermostatic control allows you to adjust the temperature for maximum comfort. An automatic over heating cut-out ensures that the product is safe and reliable. Silentnight Mica heaters have four inbuilt Mica heating elements with both convection and infrared heat, for an even spread of warmth, which will heat up in 1-2 minutes and without the noise of standard convector or fan heaters. This means your room will reach the optimum temperature you require quickly and with an adjustable thermostat that controls the heat when up to temperature and two heat settings (1000w or 2000w) you can control the warmth to whatever you need it to be quickly and easily. An overheating protector with a Thermal Cut-Out and also a safety tip-over switch means the heater is incredibly safe to use, allowing you to use this overnight when sleeping. The anti-frost setting will turn on the heater if the room becomes very cold.